It all starts with a whisper. In the spotlight, a single dancer wearing red stretches her hands heavenwards. 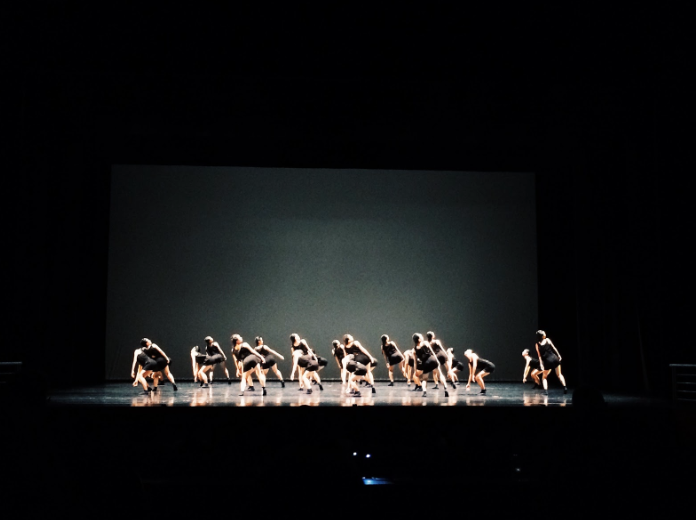 The rest of the dancers – clad in black – stand as one mute entity in the back, before an unseen cue from the soloist ripples them into action. Together, the group inches forward and moves backwards, all whilst the sibilant whispers of many overlying voices continue over the speakers. The tension created is almost palpable, as if someone is waiting and watching –– as the audience is held in suspended disbelief at the improbability of dancers dancing to something without a rhythm. After a good two minutes, a steady beat finally appears, and soon a dark melody strung by a cello comes into play. The soloist in red continues to move amongst those clad in black, who constantly sift together as several interchanging groups. 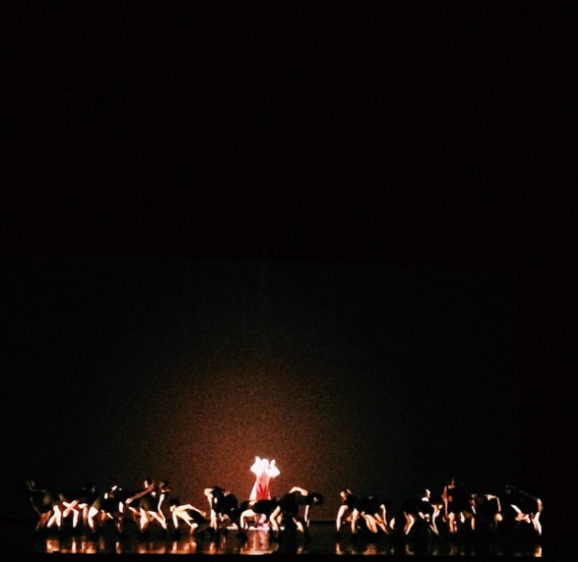 Near the end of the piece, the whispers return, leading the dancers perform a remarkable act of synchronization. This time, with their back towards the audience, they reform the mass of black from the beginning of the piece, to watch the soloist again in her increasingly frantic movements to escape the undercurrent. Ms. Low, whose works explore issues in society that she observes, often eschews elaborate costumes and formations for favour of a more direct approach. Another conscious decision by her was to create a simple but distinct colour scheme, with one soloist dressed in red and the others dressed in black. Compared to the long, flowing and intricately designed costumes worn by other schools, their costumes looked simple and commonplace. Yet, in a stage as large as that with such understated lighting, the red stood out as a single drop of colour that instantly caught the audience’s eye. Like she said, ““I didn’t want it to be overly “dramatic”, just something with foreboding tension.” In the interplay between the mass of black and that one red soloist, a message about the self was created that did not need to be overtly explained to the audience. As for the dancers, many were jittery with post-performance nerves. Although the responsibilities of rehearsals and practice had been lifted off their backs, some still cited areas they thought they could have been better in. Perhaps it is true that performers are often the most critical of their own work. Isabella Lee (15S03N), the dancer wearing red, said, “We did okay … It was our best given how we only got to practice with the stage for fifty minutes.” Later, she added, “It was a good run, but not as good as our morning rehearsal.” This, coming from the person who had shouldered most of the solo work, was akin to Beethoven saying “Thank God, there is less lack of imagination than ever before.” Granted, there were slight slips in synchronicity and moments when the soloist felt swallowed by the rest. However, one has to consider that large sections of their music had no discernible rhythm, making silent communication a paramount part of their performance. Their costumes also included socks, which made running around the stage a more slippery task than the other performers dancing barefoot. “We hope the effort pays off,” Andrea Low (16S03I) finishes. Modern Dance poses for a group shot with their coach, Teacher I/C and alumni. Well, their efforts have definitely paid off, for Modern Dance has received a Distinction for their stellar performance! 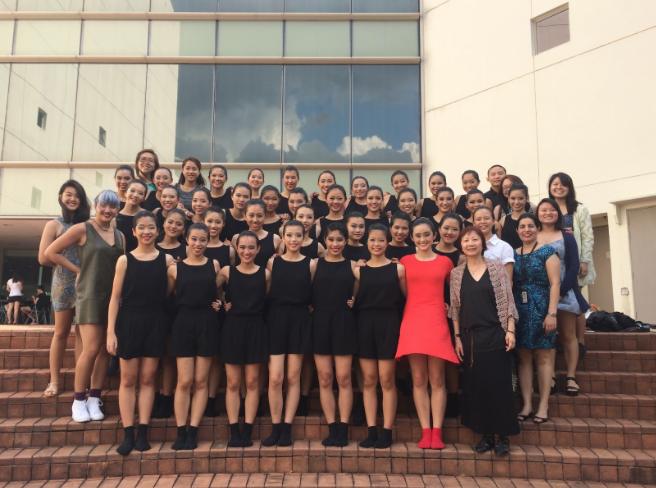 Raffles Press is proud of their achievement, and hopes that they will continue to create stunning, thought-provoking performances.